No season is more suited to road tripping than autumn. From New England to the Pacific coast, those fleeting weeks when the hot, lazy days of summer give way to winter chill are the perfect time to set tire to pavement and enjoy the transitional splendor of fall. Every town and city in America has highways and byways worth moseying along as pumpkins ripen and leaves turn red and gold. From Delaware to Alaska, Montana to Mississippi, autumn's invitation beckons. October, in particular, is a wonderful time to be on the road in America. 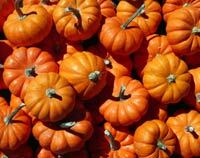 Harvest festivals abound, and there's no end to the seasonal attractions you can find in your own backyard. A weekend trek is ideal this time of year, but even a twenty-hour road trip can be restorative and pleasurable. We've chosen six great autumn routes from around the country, but think of them as single leaves in a brilliant forest, inspiration for an autumn ride wherever you might be. New Hampshire's White Mountains are always a popular autumn destination. For a route that offers beautiful vistas without bumper-to-bumper traffic, follow U.S. Highway 302 from Portland, Maine along the shores of Sebago Lake over to Fryeburg. Plan to arrive in time for the annual Fryeburg Fair, an eight-day traditional country fair held each October. 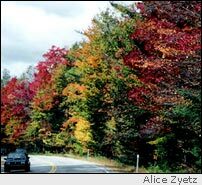 From Fryeburg, head north on state Route 113 for stunning displays of fiery red sugar maples and the yellow foliage of white birches and beeches. At U.S. Highway 2, turn west into the Shelburne Birches. A good lodging choice is the Applebrook Bed & Breakfast which is located directly across the street from Waumbek Country Club. The Waumbeck golf course, in operation since 1895, has stunning views of the Presidential Range. The elegant Mountain View Grand Hotel in nearby Whitefield is another option. 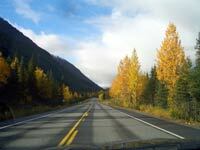 On the return trip to Portland, make the trip up the famous Mount Washington Auto Road. Ride to the summit in the historic cogwheel train for more awe-inspiring vistas. Southern Utah has more than its fair share of splendid landscapes, among them the unique red limestone formations of Bryce Canyon. Cross the southern edge of Zion National Park on State Highway 9 and head north along Long Valley on U.S. Highway 89 to Bryce Canyon Junction. Pass through the spires and hoodoos of Red Canyon into Bryce Canyon National Park. Plan to reach Sunset Point when the name suggests and watch the translucent formations of Bryce Amphitheatre light up with an otherworldly glow in the raking light. The historic Bryce Canyon Lodge, a classic example of rustic charm, is a great place to dine and stay. 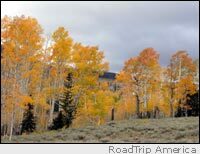 A trip to see the quaking aspens in the valleys near Cedar Breaks National Monument is also worthwhile, but bear in mind that winter snows usually close the road to this secluded park by the end of October. As everyone in Austin and San Antonio knows, a trip to the "hill country" of southwest Texas to float on the streams and lakes is a great way to escape summer heat. As autumn brings milder temperatures, it's fun to wind up a back roads ramble with a visit to New Braunfels. This old German town is known for its bratwurst, bockwurst, bierwurst - and every other kind of wurst. Time a visit for the last weekend of October, when WurstFest wraps up the town's Oktoberfest, and Halloween gets bundled into the celebration, too. Nearby is Natural Bridge Caverns, a preserve with beautiful natural limestone formations. Upscale lodging is available in the charmingly historical town of Gruene. Wine-tasting has become a traditional part of roadtripping in the Texas Hill Country as described by Aaron Reed. US Highway 441 is more famously known as the Newfound Gap Road. This scenic route offers some of the most enchanting autumn vistas in America as it winds through the misty canyons and valleys of the Great Smoky Mountains National Park. Connecting Gatlinburg, Tennessee, with Cherokee, North Carolina, the road climbs nearly 3,600 feet from the valley floor at Gatlinburg and provides stunning vistas of foliage in the Little Pigeon Valleys. Plan to stop frequently to take in the views near the road and also those accessible by footpath. For more serious hikers, a walk up Mount Le Conte is an appealing option. Several trails wind to the top, each with different vistas of the surrounding landscapes. Gatlinburg and nearby Pigeon Forge offer a wide variety of food and lodging options and other roads in the area offer more mountain scenery and autumn color. California is known for its year-round temperate climate, but special wonders await autumnal visitors to the Big Sur coastline. The Cabrillo Highway (U.S. Highway 1) offers views of secluded coves, wind-sculpted cedars and late-blooming wildflowers. The overlook near Burns Creek Bridge offers a view of the only waterfall that pours from the continent directly into the surf. On past Nepenthe, a picturesque restaurant perched on a rocky ledge above the ocean, the road crosses the famous Bixby Creek Bridge on its way up to the hamlet of Carmel and the world-renowned Pebble Beach golf resorts. Designed by Jack Neville and Douglas Grant, the Pebble Beach links have hosted such prestigious tournaments as the Pro-Am and U.S. Open Championships in recent years. The Seacliff Inn overlooking Seacliff State Beach is a great place to stay along the picturesque Monterey bay. For a different kind of "fall color," stop at Natural Bridges State Beach near Santa Cruz and walk to the Monarch Butterfly Sanctuary. Each year in early fall, tens of thousands of the bright orange and black butterflies arrive here, having flown 2,500 miles from their summer feeding grounds in the western Rocky Mountains of Canada and the Unites States. Perhaps the most striking example of the rapid transition from summer warmth to winter chill can be witnessed along Alaska's Kenai Peninsula in early autumn. A chill is in the air, and the gorgeous fall colors along the All-American Highway near Moose Pass provide clear evidence that the long nights of winter are on the way. Follow Alaska state highway 1 along the Turnagain Arm, keeping an eye out for moose that frequent this area, and then proceed south on AK-9 along the Seward Highway as you crisscross the Alaska Railroad tracks making their way to the historic town of Seward. Whether you follow one of these paths or choose another, don't miss the golden opportunity of autumn to drive America's roadways and harvest a memorable road trip!